July 10, 2017. Hockessin, Delaware. Kicking off Regal Heights’ Garden to Table Program early in the spring, Residents and staff alike were all abuzz – clearly this was more than an eager goodbye to the winter. 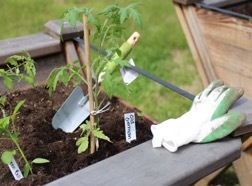 The subacute rehabilitation and long-term care center is ensuring its Residents reap the full benefits of their innovative Garden to Table Program. Recognized in Delaware and neighboring Pennsylvania for its expert post-acute services, dynamic staff, and the array of luxurious comforts and amenities it offers, Regal Heights Healthcare & Rehabilitation Center welcomed back, for the second consecutive year, Thomas McKean High School students in the FFA Volunteer Program, all of them enthusiastic about gardening – and forging relationships with the Residents. Evidently, growing edibles takes some work – but the effort spent is returned to the Residents in many different ways: gardening has been proven to reduce stress, lower blood pressure and cholesterol, and decrease depression. Indeed, mounting evidence indicates that gardening benefits mind, body and soul. “The cultivating process itself is priceless,” says Perrone. 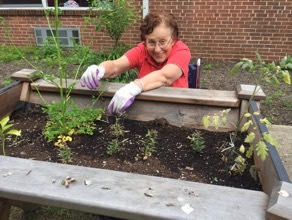 “From the interaction amongst our Residents, their connection with the younger generation, the delight in the fresh spring air and the sense of purpose it brings to everyone involved, this relaxing activity fills our Residents with purpose and anticipation. And yet … there’s nothing like taking delight in the first homegrown strawberries. Ready to eat four to six weeks after planting, the Residents were elated to see their first crop – and gratified that the first harvest of the season was going straight to the Regal Heights’ cooking club! Relishing the opportunity to contribute to the cooking club, and share the fresh strawberries with peers and staff alike, the Residents took delight in a splendid breakfast of Belgian Waffles – literally savoring “the fruits of their labor”. ← IMPORTANT NEWS FROM PA Health Care Association!